With Linutop, you can now have an all in one PC. 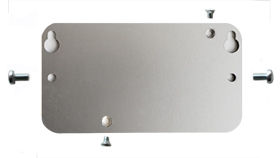 Small and strong made of steel and aluminum alloy it provides a strong mounting solution. - Allows the linutop to be Fixed on a VESA compliant monitor. - VESA 10 cm - Easy to set up. - Hide your linutop behind a screen. - Keep USB ports and audio accessible.